Disguise and protect your mini i-pad with this unique Eco Cover. 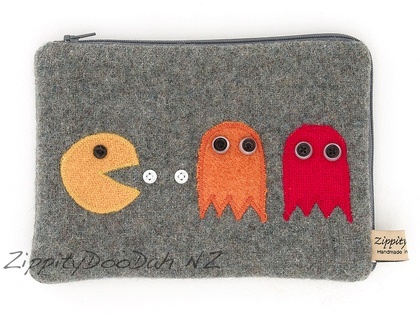 Appliqued Pac man and ghosts on front to make you smile everytime. Zip closure across top around side for easy access to your ipad.Beautifully finished to my high standards, fully lined in power spot cotton fabric, a nice little surprise each time you open the cover.